Description This Cordele, Georgia hotel has an outdoor pool, free internet access and non-smoking guest rooms. This hotel is also pet friendly. Free breakfast complimentary Wi-Fi a seasonal pool and the SAM Shortline Excursion Train one mile away are the perks guests find at the Quality Inn Cordele. All 59 rooms at the two-story Quality Inn come with coffeemakers microwaves mini-fridges free Wi-Fi and premium cable TV. Some rooms have jetted tubs. Feel free to fuel up each morning at the complimentary breakfast where you'll find a rotating menu of Belgian waffles biscuits cereal bagels pastries fresh fruit and more. Guests beat the Georgia heat with a swim in the seasonal unheated outdoor pool. The hotel's freebies include parking lobby coffee a guest-use PC and access to a nearby fitness center. Pets 30 pounds or less are allowed for a small nightly fee. The Quality Inn is on 16th Avenue/US-280/SR-30 just west of I-75/SR-401. It's one mile east of downtown Cordele and the SAM Shortline Excursion Train. Watermelon Capital Speedway is five miles north. The hotel is 43 miles northeast of Southwest Georgia Regional Airport in Albany. 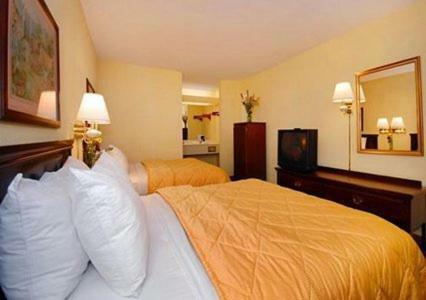 Add Quality Inn Cordele to your free online travel itinerary.